(VCCINEWS) State President Truong Tan Sang, accompanied by a high-ranking State delegation of Vietnam, will pay an official visit to Japan in March 2014 to further enhance the bilateral strategic partnership. On this occasion, the Vietnam Chamber of Commerce and Industry (VCCI) will lead a business delegation to attend Vietnam - Japan manufacturing business connections in Tokyo and Fokuoka Prefecture. Vietnam Business Forum has an interview with Mr Nguyen Hoang, Vice President of Vietnam - Japan Business Forum (VJBF), Chairman of the Hanoi Supporting Industry Business Association (HANSIBA) and President and CEO of N&G Corp.
At the Vietnam - Japan Investment and Scientific - Technological Forum 2013 in Fukuoka Prefecture, Governor of Fukuoka Prefecture affirmed that the prefecture would work with the Consulate of Vietnam in Fukuoka to support HANSIBA and N&G Corp to organise a workshop on investment promotion in Fukuoka. Could you tell us more about the plan and expectations of HANSIBA and N&G Corp for this event? According to Decision 1043/QD-TTg dated July 1, 2013 of the Prime Minister approving the Vietnam industrialisation strategy in the Vietnam - Japan cooperation framework toward 2020, with a vision to 2030, HANSIBA in general and the Hanoi Southern supporting Industrial Park (Hanssip) in particular have been actively preparing a detailed action plan to focus human and material resources to a maximum for cooperation in supporting industry development with Japanese partners. HANSIBA and N&G Corp will host a seminar on investment promotion in Fukuoka City in May 2014, shortly after the visit of Vietnamese President to Japan. The in-depth workshop on supporting industries will focus on cooperation for the robust development of supporting industries in Hanoi in particular and Vietnam in general. The event will broadcast a message of willing cooperation in supporting industry development to Japanese investors and partners. So far, Hanssip has built basic infrastructure and resources for developing supporting industries according to Japanese standards and Vietnamese realities, in order to attract Japanese investors. Together with Hanssip, HANSIBA members have been actively preparing necessary and sufficient conditions for the best collaboration with Japanese partners. 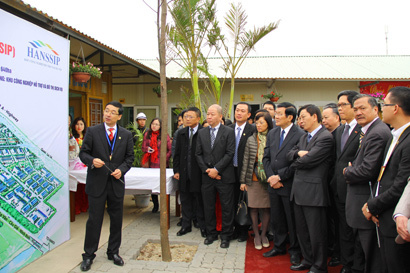 Particularly, in February 2014, President Truong Tan Sang, accompanied by central and Hanoi officials, visited Hanssip. This reaffirmed that Hanssip in particular and supporting industry in general are being strongly supported and cared by the Party, the State and the Governments of all levels, in order to facilitate Vietnamese supporting industries to enter global production - supply value chains and raise their independence in economic development. Hanssip is receiving special care of Hanoi and central authorities. How do you and N&G Corp as a whole assess Hanssip’s potential for attracting Japanese partners? With a series of agreements to be enforced, Vietnam is seeing huge opportunities and challenges. On his working visit to Hanssip, President Truong Tan Sang stressed that the recent formation of the first supporting industry zone was too late, particularly compared with other countries in the region. Vietnam needs to accelerate the shift from outsourcing to in-house manufacturing and sustain development in the process of deeper regional and global integration. Supporting industries are the right direction to raise added value for investors in Vietnam and help quicken the national industrialisation strategy with the goal of making Vietnam a basically industrialised nation by 2020. And, during the upcoming Japan tour by the Vietnamese President, N&G Corp will sign cooperation agreements with Japanese investors to develop 100 ha of industrial moulding complex. They are parts manufacturers in Japan. Hence, we are completely confident in successful cooperation with Japanese partners at Hanssip in particular and Vietnamese supporting industry in general when the two countries have become strategic partners.